With this life-long love interest, you can imagine my girlish squeal when helping my 2 year old son open Christmas presents to see that his aunt had bought him a copy of "Not Quite Narwhal " by Jesse Sima. A fantastic--and very sweet--tale of a unicorn born to a family of narwhals in the ocean. He knows he's different from the moment he's born, because he doesn't quite fit in with other narwhals--although they love him all the same. One day a strong currant sweeps Kelp into an adventure that leads him on a path of self-discovery. A perfect book for any child who feels a little "different" (aptly fitting for my son and myself who are both autistic), I instantly fell in love the first time we read it for story time! 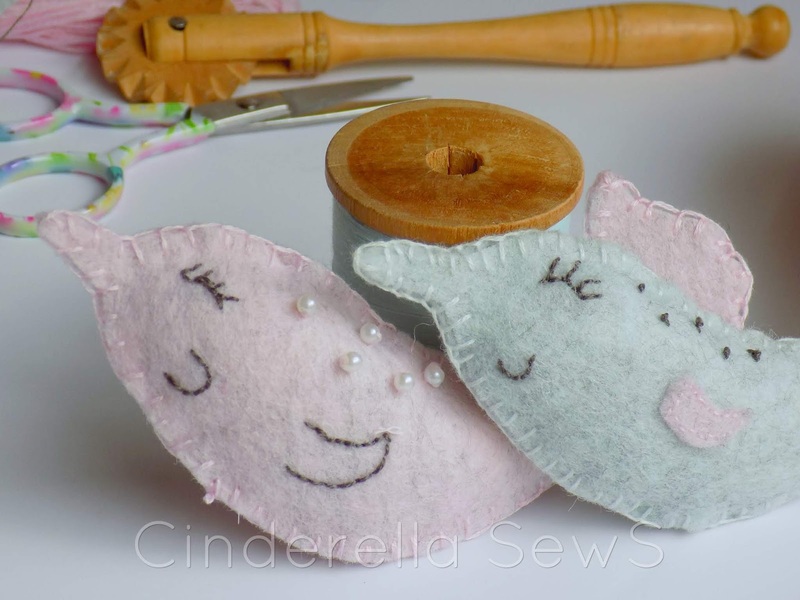 My youngest is now officially obsessed with unicorns and narwhals right along with his mama, so when I heard about the "Sew a Softie" month of July, I knew that my "teaser" opening blog post should be a softie featuring one of our family's favorite animals! The premise of the "Sew a Softie" movement is an initiative to put down the electronics and foster some patience and love of hand-sewing. I, personally, love hand-sewing! It's relaxing, beautiful, useful, and fun! My sewing machine regularly gathers dust between projects, because I will hand-sew to oblivion before turning that thing on! If you are a total beginner--have no fear!! This post (and the other wonderful sewists who contribute free patterns for the movement) is meant to inspire and teach beginners, children, and experienced crafters alike. There are a few stitches to learn that will be super easy in no time (after a little practice) and many of the projects involve non-fraying wool felt--the perfect fabric for beginners! I definitely recommend using wool felt only for this pattern! It is much sturdier and more durable (not to mention more beautiful and softer) than the acrylic wanna-be felt found at craft stores. I purchase my felt from several sources, namely Joggles and My Felt Lady. Print your pattern and cut it out. 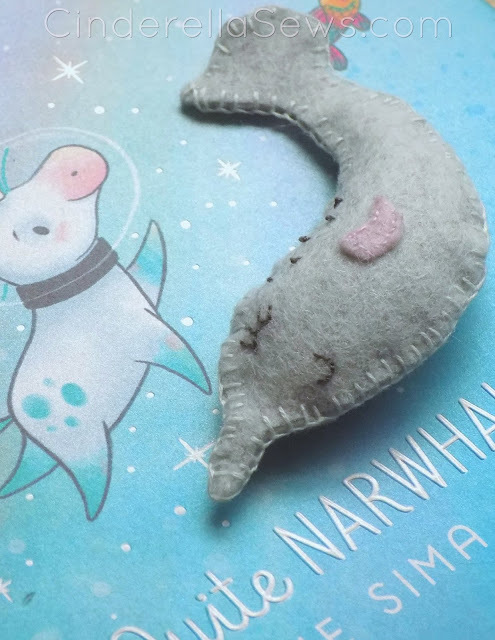 You can either trace it onto your felt with a Disappearing Ink Pen or pin the pattern to one felt sheet at a time (you'll need 2 narwhal "bodies" and one fin) and cut it out. **Tip: When cutting felt, it’s important to use small, sharp scissors. Embroidery Scissors are best, as they provide the most accurate, clean results. If you are completely new to the stitches I mention below—or even how to make a knot in your thread—you can see how to do all of them in this video tutorial. Next, you’ll want to pin your fin to the narwhal’s body and use a backstitch to attach it. As you can see in my photos, I chose to embroider one fin and do an appliqué fin on another. The look is up to you! Once finished, draw your narwhal’s features onto your top felt piece with the disappearing ink pen or a pencil. Use backstitches again to add the mouth and eyes, then use French knots or tiny pearls (using a simple running stitch through all of the pearls) for the freckles. If you would like a better template than drawing them directly onto the fabric, trace the pattern onto a piece of tissue paper, pin it to your narwhal’s body, and sew through the paper and your felt. Once finished with your embroidery, simply rip the paper away (which is really fun for kids) and your stitches will stay where they need to be! I personally prefer drawing straight on the fabric, because the stitches come out neater, but whichever makes you more comfortable! Once totally happy with your embroidery, you’ll need to use a blanket stitch (also in the video) to sew your two narwhal bodies together. Remember to leave a little opening on the belly to add stuffing before completely closing your stitches! Take a photo of your finished narwhal and tag me @cinderellasews on Instagram or leave a “Tried It” review on Pinterest to show off your handiwork! I hope you enjoyed this tutorial, there will be many more to come 😊 If you'd like to see more, remember to sign up for the newsletter! Welcome to Sew a Softie month Ashley. Your narwhal softie is beautiful and you've written a great simple to follow tutorial. Looking forward to seeing more of your amazing softies.